Directed by George Roy Hill and written by William Goldman, Butch Cassidy and the Sundance Kid is the story of a pair of outlaws whose notoriety forces them to flee America to Bolivia in the hope of robbing more banks. The film is an unconventional western that play into two men trying to live a good life and make money through robbery as they also endure the changes of the West. Starring Paul Newman, Robert Redford, Katharine Ross, Strother Martin, Jeff Corey, and Henry Jones. Butch Cassidy and the Sundance Kid is an adventurous and thrilling film from George Roy Hill. Set in the late 1890s before the turn of the century, the film revolves around a pair of outlaws whose work in robbing trains and banks suddenly takes a turn when they’re being pursued by a posse who wants them dead forcing the duo to go to Bolivia with one of their girlfriends in the hope of escape. It’s a film that play into a way of life and the emergence of change towards the end of the century forcing these two men to find another world that hasn’t caught up with these growing changes. William Goldman’s screenplay definitely play into this air of change though it begins with Butch Cassidy (Paul Newman) and the Sundance Kid (Robert Redford) at a small town where the former is looking at a bank while the latter is playing cards as people know about their infamy as robbers. Yet, the lack of serious work prompts many to question Cassidy’s leadership in the gang he runs as they would eventually find a train to rob. For all of its success, it would be fleeting as a second robbery would be the catalyst for not just trouble but also being pursued by a posse that is unlike anything else. Butch and Sundance are just two men who know what to do as Butch is the man with ideas while Sundance is a man of action but they still bring out the best in each other as they also have an unlikely partnership with Sundance’s lover Etta Place (Katharine Ross) who knows about their exploits but often remains quiet until she chooses to join them on the journey to Bolivia. Much of the film’s first half is set in America while the second half is set in Bolivia where Goldman play into this idea of uncertainty but also culture shock. Still, it does give the duo an advantage in robbing banks with Etta’s help for some of the robberies where it does bring this sense of euphoria for all three but there’s also elements of paranoia as it relates to the posse that was pursuing them. The third act in Bolivia also play into Butch and Sundance’s attempt to go straight but the notoriety they had created in Bolivia has only created more trouble. George Roy Hill’s direction is definitely engaging for the way he captures this air of change in the American West and the need for these two outlaws to go to Bolivia to maintain their idea of robbery in the old ways. Shot on various locations in Utah, New Mexico, Colorado, Arizona, and California for the scenes in America with the scenes in Bolivia shot in Mexico, the film does play into this world of the American West as a world that was wild and free but a growing sense of law and order is emerging but also the idea that big business can control things. The film’s opening sequence is shot in a sepia-like look reminiscent of early photographs as it play into their sense of adventure but also in being men that are becoming out of step with the times. Then the film goes into color as Hill would use wide shots of the locations along with unique compositions to play into the danger as it relates to the posse that is going after Butch and Sundance. Even as the shot would be shown from their perspective where they see the posse from afar who are a determined group that isn’t fooled by any tricks. 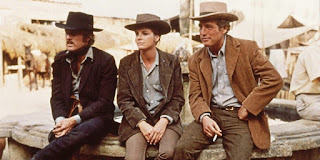 The film would also have Hill use medium shots and close-ups as it relates to the conversations between Butch, Sundance, and Etta that add to the sense of character and their motivations for a good life. The film would include a great sequence of old-school photograph stills montage to play into the journey that the three would embark from the West to South America as it has elements of humor but also this air of adventure until they arrive in Bolivia not realizing that it’s a totally different world with some different rules. Notably as Butch and Sundance know little Spanish forcing Etta to teach them certain phrases during the robberies. The film’s third act definitely marks a shift in tone where it is darker with the added element of violence along with revelations into Butch and Sundance’s own infamy in their robberies. It also include the fact that the Bolivians are a completely dangerous whenever they feel antagonized leading to this epic showdown that is thrilling but also with a lot at stake. Overall, Hill crafts an exhilarating film about two outlaws trying to maintain their way of life in the West and in Bolivia. Cinematographer Conrad Hall does amazing work with the film’s cinematography from the usage of sepia-like colors for the film’s opening sequence to the dreamy look of some of the exterior scenes in the day and night in the deserts along with some low-key lights for some of the interiors at night. Editors John C. Howard and Richard C. Meyer do excellent work with the editing as its usage of dissolves, montages, and transitional wipes help play into the action and humor with some rhythmic cuts to play into bits of the suspense. Art directors Philip M. Jefferies and Jack Martin Smith, along with set decorators Chester Bayhi and Walter M. Scott, do fantastic work with the look of the farm that Etta lives at as well as the places in Bolivia and the train carts in America. Costume designer Edith Head does excellent work with the costumes as it play into the turn of the century with some stylish dresses that Etta wears as well as the uniforms worn by the Bolivian police and its military. The sound work of David Dockendorf and Bill Edmondson is terrific for the way it captures gunfire and other sound effects as well as the intense atmosphere of the film’s climatic showdown between Butch and Sundance against the Bolivians. The film’s music by Burt Bacharach is incredible as its playful usage of orchestration add a lot to the film’s sense of adventure and humor that would also include the song Raindrops Keep Fallin’ on My Head written by Bacharach and Hal David that is sung by B.J. Thomas for a lively scene involving Butch and Etta with the new invention in a bicycle. The film’s wonderful cast include some notable small roles from Cloris Leachman as a prostitute Butch occasionally sleeps with, Ted Cassidy as a gang member who challenges Butch’s leadership in Harvey Logan, Charles Dierkop as a gang member in Flat Nose Curry, Kenneth Mars as a marshal trying to get everyone to find Butch and Sundance, George Furth as a railroad bank worker named Woodcock whom Butch and Sundance run into, Henry Jones as a bicycle salesman, Jeff Corey as Sheriff Bledsoe who helps Butch and Sundance evade the posse, and Strother Martin as mining company boss in Percy Garris who runs a Bolivian mining company that tries to give Butch and Sundance a chance to live a straight life. Katharine Ross is remarkable as Etta Place as a schoolteacher who runs her own farm as she is Sundance’s lover as someone who isn’t entirely fond of what Sundance does but does join him and Butch to Bolivia where she helps them rob banks until danger starts to emerge. Finally, there’s the duo of Paul Newman and Robert Redford in phenomenal performances in their respective roles as Butch Cassidy and the Sundance Kid where they both have this air of camaraderie in the way they deal with each other but also bring out the best with Newman being the man who is the thinker and trying to come up with ideas and Redford as the man of action who is also skeptical of Butch’s ideas but often follows along as Newman and Redford are a joy to watch as well as provide that air of true friendship that is often lost in films. Butch Cassidy and the Sundance Kid is a magnificent film from George Roy Hill. Featuring top-notch performances from Paul Newman, Robert Redford, and Katharine Ross along with William Goldman’s inventive screenplay, Burt Bacharach’s whimsical score, gorgeous visuals, and the theme of changing times in the West. The film isn’t just a western that has a lot of thrills but also play into two men trying to hold on to their ideals and way of life before the arrival of the 20th Century. In the end, Butch Cassidy and the Sundance Kid is an outstanding film from George Roy Hill. Glad you liked this film. I loved the chemistry between the leads. I've never seen this either and I'm not sure I ever will. Westerns still remain the hardest genre for me to watch. I rarely get into them. @vinnie-This film was fun from start to finish as I had a ball watching Paul Newman and Robert Redford. I guess that is why Redford got Paul Newman a cameo as salad dressing in Captain America: The Winter Soldier. He just needed his friend. @Brittani-Westerns is definitely not a genre for everyone but they shouldn't be dismissed. It takes time to find the right films as well as films that play with the conventions of the genre. It is a terrific film even for those who don't necessarily like Westerns because of that chemistry between Newman and Redford. Their interplay and the mega success of the film lead to the rise of the buddy film which reigned supreme for years much to the detriment of strong female leads. Funny the way those things happen, it was supposed to be Newman and Steve McQueen but McQueen turned it down when he wasn't able to get top billing and Redford stepped in. It certainly was a turning point for him. Up until this he was a rising young leading man who had a big success with his previous picture Barefoot in the Park-which had also been a major success for him on Broadway-but hadn't broken him out of the pack. From this point on though he was big box office for a couple decades. @joel65913-I can't see Steve McQueen in that film. I like McQueen but I prefer Robert Redford as just seeing him and Newman together was fun to watch as it was obvious these were 2 guys who probably had a lot in common and probably had more fun off set with each other it would translate to what is shown on screen. Excellent movie. It's such a blast and the chemistry between Newman and Redford is off the charts. Glad you enjoyed it. @Wendell-I'm glad I chose it as a Blind Spot as it was so fun to watch and definitely a western that doesn't play by the rules but still had more than enough elements to make it a definitive entry in the genre. It's been a while, but I really liked this film, too. It was one of my first westerns, and in August I'm watching The Good The Bad and the Ugly for the first time, which is such a huge blind spot. @Sofia-Oh, The Good, the Bad, & the Ugly is one of my top 5 all-time favorite films.... ever. I hope the version you see is an extended restored edition which is a masterpiece in its own right. To me, it's the best western.... e-e-e-e-e-ever!